06/11/2010: This Work in Progress to Completed project was carried over from my Bellsouth Art Diary, Personal Web Pages. I've had this stool sitting around for months awaiting it's turn. Okay, here we go; this is the next indoor project. Removed legs (they slide, then are glued in place) and sanded stool and legs. Selected a flower garden picture cut from a plate, and some blue and white glass from 'already cut' inventory. Cut blue plate glass to 1 1/4" pieces to fit side edges of stool. Cut small blue pieces to form edge/border on top of stool. 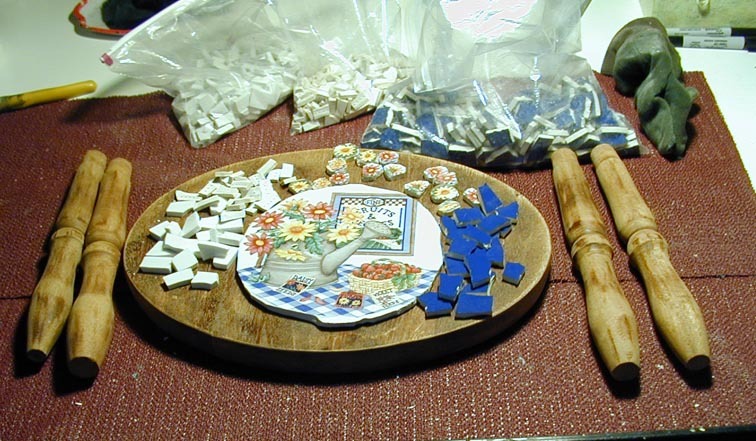 Cut white pieces to smaller sizes. Cut solid circle plate pattern into manageable pieces. Nipped edges of everything but plate picture (Nipping might distort the design). Using mastic to apply china to stool. Applied blue border around the edges and centered/applied floral piece in the center. Quit for lunch with the boys (before LSU). Complete applying china (with mastic) to the stool. (Individually buttered each piece). Amazing that I finished this project with only 13 pieces left over. When I prepare china for a piece, I always make a guess at how much of each I think I'll need. This is the closest I've ever come. Cleaned china with clean cloth dipped in vinegar to remove any stray mastic. Applied two coats of bright blue paint to bottom of legs of stool. (Coats about 1 hour apart; legs painted in sections. Before bed, applied a coat of clear gloss varnish. When dry, will set aside for grouting at end of month. a) Mixed small amount of white grout (in same cup as used in Azalea Pot; just finished grouting). b) Applied grout to stool using hands to press into spaces between glass shards on tops and sides. c) Carefully applied additional grout to fill in gap between sides and tops, to develop a uniform appearance. d) With damp sponge, lightly wiped grout from glass (tops & sides). You have to be careful in this step to ensure you do not pull the grout back out of the crevices. e) When completed, set stool aside for about a half hour, then returned to light buff the glass and remove the built-up haze from the grout. Applied Sealer "Impregnator" with a small artist brush to tops and sides of stool. Applied in two heavy coats, allowing sealer to soak into grout. b) Waited 10 minutes, then wiped off residue from liquid sealer from tops of glass. This is 'almost' the end of the Spring Garden Stool Project. I'll let this one air for a couple of days (Sealer has quite an odor ... best to let the odor go away prior to boxing up and putting away), then I'll put on the legs and take pictures for the mosaic gallery.